SG-1 returns from P9X-391 with an unusual alien artifact. Shortly after their return, Jonas sees what appears to be an enormous flying insect-like creature in the gateroom, capable of passing through solid matter. Despite a full search of the base, no one else sees the creature, and Jonas submits to medical tests, but is found to be in perfect health. Carter and Jonas study the artifact, and ascertain that it is emitting energy, but they are unable to determine its purpose. However, when Teal'c and Jonas both see another of the creatures, it seems that the alien device may be responsible. O'Neill is on leave and heading for a weekend of fishing when he stops at a gas station, and he, too, witnesses a large flying creature. 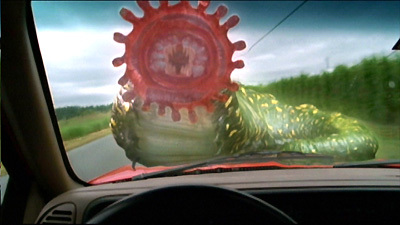 Jonas and Carter speculate that the creatures are native to Earth, but exist in another dimension, and that the device merely makes them visible. However, as reports of similar sightings begin coming in from both the base and the community, it appears that person-to-person contact is spreading the phenomenon, and it is feared a public panic will result. Returning the device to P9X-391 does not eliminate the sightings, and the SGC must now contain the situation around Colorado Springs. Carter and Jonas search for a way to reverse the effects of the alien device as O'Neill coordinates a quarantine of the area. However, when Vernon Sharpe, the gas station attendant, sees the creatures, he fears he is a victim of government experimentation following the Gulf War, and he flees to a small airfield, spreading the effect as he goes. Carter and Jonas finally determine that realigning the crystals will reverse the effect, which can also be passed on by touch. As the antidote is spread, O'Neill tracks down Vernon Sharpe and appeals to his sense of duty and patriotism, to keep the incident quiet. The inter-dimensional device discovered among the ruins of P9X-391 is apparently of Ancient design. It emits energy waves that trigger a bleed-through effect resulting in the ability to see creatures that exist in a parallel dimension. Touching the device imparts a kind of charge that can alter a body’s electrical field enough to cause the inter-dimensional bleed-through effect, and the charge can be passed on person to person by touch. Hammond orders a Class-One Security Lockdown of the base when Jonas first sees the insects. Hammond orders the immediate containment of Colorado Springs and the surrounding area. The cover story for the quarantine is the accidental spill of an experimental chemical that can have a hallucinogenic effect. Through Vernon, the effects spread as far as Hawthorne County and the Piedmont Hawthorne Airfield. Vernon Sharpe, a veteran of the Gulf War, now runs the Glenwood Market and full service gas station about 30 kilometers north of Colorado Springs. O’Neill attempts another fishing trip to Minnesota. Anderson Air serves the Piedmont Hawthorne Airfield. The aliens are from a place called Melmac, although O’Neill claims to have never seen ALF.